Nice, but only for "downloadable" models, if you search in Blender and search on sketchfab site with "Downloadable" checkbox active - you got the same results (+ paid ones on the site). And I'm not sure if this converted models is better then ones in "original format" you can download manually. Hi I'm trying to extract this model for study UV Mapping, but only got the textures, can you help me? how did you get the textures? I also find out that two component out of three components of each vertices are some how correct. (some times x,y is correct; sometimes y,z; sometimes x,z). the question is how does Graphics card knows how to render the 3d model correctly if Ninja Ripper can not? Settings - Intruder Inject, Forced . It only works with textures . 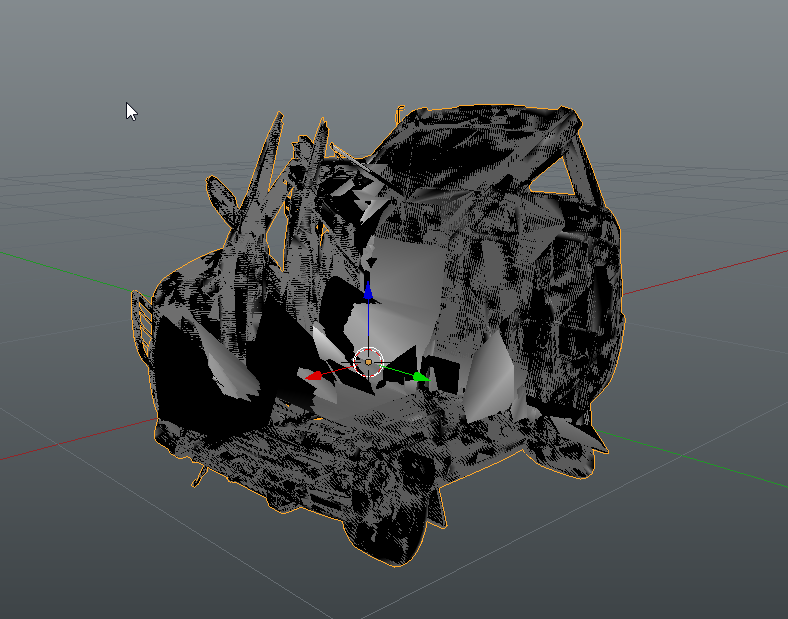 My 3d mesh looks smashed like yours. I repeat myself but Ninja Ripper doesn't work with sketchfab anymore. M0fD wrote: I repeat myself but Ninja Ripper doesn't work with sketchfab anymore. why? how does browser know how to draw model correctly but Ninja ripper can not figure it out? how does Ninja ripper work? shouldn't it capture the graphic card exactly as is? What doet the geaphic card had to do with that ? Well the browser read the information given by sketchfab and ninja ripper is supposed to rip the viewed model at it is, but SURPRISE ! Ripping is illegal and sketchfab made a script who don't allow ninja ripper to work correctly. Anyway, please read the thread first before asking that kind of questions. was discussed before. i gotta repeat the technicalities? ninja ripper intercepts the raw polygon data before it is transformed into the coordinate space you see on screen. i'm not sure if the data is stored deformed (since the python thingy is cryptic math and outputs correct), but i'd guess, from what i observed and not tested, you'd have to run that lil bit of their viewer's shader code to 'fix' the ripped data, which could only be done if you hijack/rip the (per drawcall) vertex shader constant buffer with it, to get the parameters for this 'anti-deformation' function, i think it is. Last edited by episoder on Sat Oct 20, 2018 8:20 pm, edited 1 time in total. at the top set BINDPOSE 0 before executing the iscript. when imported, rename and attach the correct ref skelly to the mesh via adding the modifier in the buttons window (this can be hard to figure out if you're new to it and blender). test the bone deformation. when applied correct you can export. ofc you gotta export a format (i recommend fbx) that is capable of storing all of the skelly data and stuff (and have everything selected or remove the pose skelly and export scene objects). depending on the capabilities of your modelling tool's importer you may then have to convert the export to a binary or recent format. the thing that is not working is the hierarchy of the skeleton, which you have to setup yourself. but... that's what you get for free and fair even. set BINDPOSE 0. rename and attach the correct ref skelly to the mesh via adding the modifier in the buttons window (this can be hard to figure out if you're new to it and blender). test the bone deformation. then export. ofc you gotta export a format (i recommend fbx) that is capable of storing all of the skelly and stuff, and have everything selected or remove the pose skelly and export scene objects. depending on the capabilities of your modelling tool's importer you may then have to convert it to a binary or recent format. Thank You for It! Thank you with your time ! Blender is for me Black Magic. ... I have no idea where to find it ----> rename and attach the correct ref skelly to the mesh via adding the modifier in the buttons window.